New Delhi: Prime Minister Narendra Modi inaugurated the yet-to-be completed circuit bench of the Calcutta High Court in Jalpaiguri last week without keeping West Bengal Chief Minister Mamata Banerjee in the loop, violating a key convention of India’s federal structure and stoking yet another showdown with the state administration. Since the expenditure of high courts, including circuit benches, are borne by the state government, the norm has been that any decision in such matters is taken with the active involvement of the local administration. Circuit benches are temporary courts set up in remote areas that don’t account for enough cases to warrant a permanent bench. The Jalpaguri circuit bench will cater to the four north Bengal districts of Darjeeling, Kalimpong, Jalpaiguri and Cooch Behar, leaving out two districts that were part of the original proposal mooted in the 1980s, Malda and West Dinajpur (which was bifurcated sometime back into North and South Dinajpur). The move is said to be fraught with political significance since it is believed that it will help the Bharatiya Janata Party (BJP) strengthen its hold over Darjeeling, which has been with the party for two consecutive terms now. The NDA government’s actions have led to sharp criticism from Banjeree and her government, and there are indications that it could blow up into a major issue. The controversy came days after the Centre and the Mamata Banerjee government in West Bengal faced off over an attempt by the CBI to question Kolkata police commissioner Rajeev Kumar at his home. The state had last year withdrawn the general consent the CBI needs to pursue investigations in a state, and the CBI team’s arrival led Mamata to launch a dharna. The proposal for a circuit bench at Jalpaiguri was first mooted at a fullcourt meeting of the Calcutta High Court in 1988. The Union Cabinet had approved the proposal in 2006 and a presidential notification to this effect was issued in 2013. However, resistance from lawyers and the unavailability of infrastructure prevented the new circuit bench from being operationalised. Modi inaugurated the new circuit bench when he visited Jalpaiguri on 8 February. On 6 February, two days before the PM’s visit to Jalpaiguri, the Union cabinet suddenly passed a fresh proposal to set up the circuit bench. 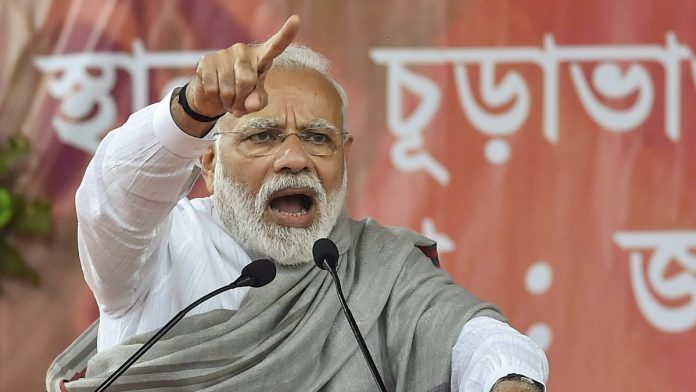 However, what the Modi government didn’t let out was that the new bench would only serve the four districts of Darjeeling, Kalimpong, Jalpaiguri and Cooch Behar. Within hours, a presidential approval was obtained for the proposal and a formal notification issued the next day. However, when Modi “inaugurated” the new bench, neither the state government nor the state high court was represented at the event. Another reason the move has upset the West Bengal government is that the parts that have been left out are strongholds of the opposition, with Banerjee eyeing Malda, a Congress stronghold, in particular ahead of the Lok Sabha election season. Just last month, the Congress MP for Malda Uttar, Mausam Noor, joined the Trinamool Congress. Hers is one of two Malda Lok Sabha constituencies, which have been Congress strongholds under Noor’s family for years. It is learnt that the Calcutta High Court is now planning another programme next month where the Acting Chief Justice will inaugurate the new bench, again. The Jalpaiguri circuit bench is not the first circuit bench of the country’s oldest high court. It already has a functional circuit bench at Andaman and Nicobar Islands.